Peter Doig caught a prolific inspiration theme in a terrible scene from the movie Friday the 13th, which turns out to have been a nightmare in the following of the story. The picture of the swamp in the moonlight just before or just after the crime already raises the question of the relationship of humans with nature. As for Monet's lily pond, the image includes both the lake shore and its reflection in water. The white boat and its reflection are too sparkling for their light to come only from the moon. This intense internal lighting is meaning that it is the last remaining element from the human civilization. On May 11 in New York, Christie's sells Swamped, oil on canvas 197 x 241 cm painted in 1990, lot 5A. The press release edited on April 24 by the auction house tells that they expect a record with this outstanding painting, with a price around $ 20M. On 7 February 2007, Sotheby's sold for £ 5.7 million including premium over a lower estimate of £ 800K another painting of similar size, probably executed later because it is dated 1990-1991 with a title, White canoe, that removes the hint to the film inspiration of the series. On that day, the art market had pushed to the highest level this young artist who works with meticulous care over large sizes while assimilating the technical inputs of the great masters of his century including Klimt, Pollock and Richter. The following of his work is varied, with a thread that questions and criticizes the role of humanity and the decline of its incongruous traces in nature. Doig admits an admiration for Hopper. He is one of the most important and original contemporary artists. Just after graduating as Master from the Chelsea School of Art, Peter Doig was awarded the Whitechapel Artist Prize with an invitation to prepare a solo exhibition to be held in August and September 1991 at the Whitechapel Art Gallery in London. The young artist develops an entirely new vision of the scenery, taking altogether into account the techniques of Action painting and the color balances of abstract expressionism. His effect of presence supported by the large size of the canvases is not based on a perspective but on the masking of the remote scenery by a pattern from nature or on the difficult interpretation of a reflection in water. The horizon is not useful in such compositions and disappears as from Monet's pond. In the previous year his Swamps recreated an atmosphere inspired by the movies. In his preparation for the Whitechapel show, Doig reuses his own winter photos in the ravines of Rosedale, a suburb of Toronto populated by rich and sumptuous mansions. The Architect's Home in the ravine reveals an opulent villa through the trunks and leafless branches of the forest, with a very meticulous work of lines and colors. This oil on canvas 200 x 250 cm was sold for £ 11.3M including premium by Christie's on February 11, 2016. On May 18 in New York, Phillips sells at lot 9 an oil on canvas 200 x 240 cm simply titled Rosedale. The April 19 press release announces that it is expected to realize in excess of $ 25M. Even more than the Architect's Home, Rosedale opens the way to Doig's new style and technique. The classical logic would have required the building to be drawn before the elements that partially conceal it. Doig does the opposite. The image is also dotted in a white pointillism that expresses the cold of winter. The artist affirms his sensitivity to some winter scenes by Bruegel in which snow is everywhere without being preponderant. ​Please watch the video shared by Phillips. The Architect's Home in the Ravine is an early masterpiece by Peter Doig. It was sold for $ 3.6M including premium by Sotheby's on May 15, 2007, for £ 7.7M including premium by Christie's on February 13, 2013 and for £ 11.3M including premium by Christie's on February 11, 2016, lot 18. Please watch the video shared in 2013 by Christie's. It is now estimated £ 14M for sale by Sotheby's in London on March 7, lot 12. Nature, even when it is wild, is influenced by humans, although such an interaction is sometimes difficult. Peter Doig is the best contemporary landscape painter. He creates some imaginary scenery from documents which may include photographs taken by himself. Human figures are absent or discrete. The horizon is useless. The atmosphere is made of a subtle pattern of lines and colors by which the artist shows that he has assimilated various trends of modern art. In 1991, aged 32, he is overwhelmed by the Cité Radieuse at Briey-en-Forêt near Metz, regarded 30 years earlier as a masterpiece by Le Corbusier. In the woods, this large dwelling unit had been difficult to maintain in its original purpose of social housing. It is threatened of destruction and rapidly loses its polychromy. Through the tight branches, Doig may imagine everything : is the house still alive or already dead? Is it even yet accessible ? Now mixing this new emotion with his childhood memory in Canada he transfers the question onto another modernist house built by Eberhard Zeidler in a ravine at Rosedale near Toronto. The oil on canvas 200 x 250 cm shows the imposing Rosedale house laid down in its small valley, offered or hidden through a dense network of winter twigs, similar as a figurative Pollock whose annihilation by the lines would not have been completed. In 1990 Peter Doig completes his studies at the Chelsea School of Art. He begins a painting on a daring theme that will bring together his two fascinations, for his own memory and for the strongest emotions of cinema. He associates the snowball and the Rosebud enigma of Citizen Kane to his childhood in Canada. He constructs this work as a confrontation of worlds dominated by the central oval of a snowstorm that pushes back to the edges of his memory the cabin and the forest. The flakes are scattered on this veil altogether dark and slightly transparent. Blur enhances the dreamlike impression. A school security agent named Charley watches and says "Huh, Space". He was seeing a starry sky and not a snowstorm. Far from discouraging the young artist, this erroneous but plausible interpretation excites his enthusiasm. The pictorial art does not reflect a reality but an emotion prepared by the artist and which can be perceived differently by the observer. Completed in 1991 this 183 x 127 cm oil on canvas is titled Charley's Space. In 2003-2004 it will be used as the title of a solo exhibition in Maastricht : Peter Doig has not forgotten the involuntarily deep lesson received from his visitor. It is estimated £ 6M for sale by Christie's in London on March 6, lot 27. Monet knew how to show the transparent surface of his pond. Doig becomes the virtuoso of the falling snow, more or less dense, within more or less fog, but from then in a more homogeneous universe. Painted also in 1991 and reusing the same cabin and forest, Pink Snow 244 x 198 cm is conserved at the MoMA. Painted in 1994, a scene in Cobourg is a culmination of this effect of blizzard ambience. This 200 x 250 cm oil on canvas was sold for £ 12.7M including premium by Christie's on March 7, 2017. Charley's Space is introduced with another snow scene in the video shared by Christie's. The man leaves sometimes within nature the grandiose remains of his desires and of his abandoned projects. Peter Doig is an explorer of such lost sites that emit an intense emotion. He is also a contemporary painter with an impeccable technique who readily acknowledges the influence of the masters onto his art. His large size paintings provide a fascinating effect. His bold compositions are inspired by Cézanne, who knew to incorporate foregrounds in a scenery without hiding the majesty of the background while also avoiding to cheat against the laws of perspective. The achievement is the impression of an approachable infinity. 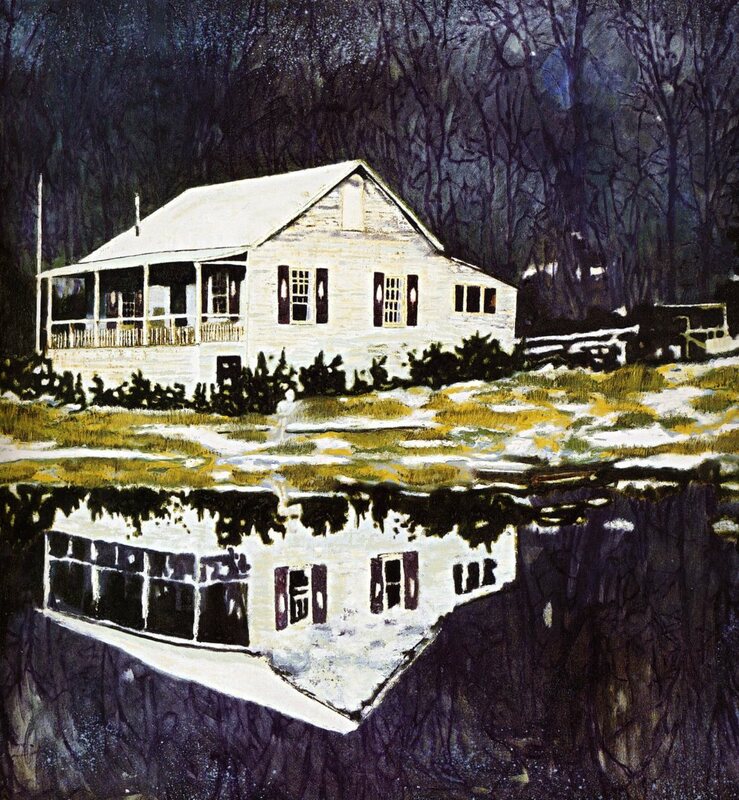 In his imaginary scenes with empty canoes in a wild forest, Doig achieved this effect by the reflection in the water and the disappearance of the horizon. Swamped, painted in 1990, was sold for $ 26M including premium by Christie's on May 11, 2015. The artist visited in 1991 Le Corbusier's cité in Briey-en-Forêt, emptied fifteen years before. He was influenced by its architectural style that is linked to the abstract expression of nature by Mondrian. Above all, the view of this ghost urbanization through the dense network of trees provided one of these post-Cézannian themes which were the thread of his own research. He began the series entitled Concrete Cabins. Painted in 1991, the Architect's home in the ravine is a daylight view of a site near Toronto. The house is gradually covered by the trees same as when Pollock covered his canvases with colors. This oil on canvas 200 x 250 cm was sold for £ 7.7 million including premium by Christie's on February 13, 2013. On October 16 in London, Christie's sells Cabin Essence Black, oil on canvas 230 x 350 cm dated 1993-1994, lot 11. The large building in the night, inspired from Briey, seems very near with its many lights filtered through the dark trees. Doig was probably influenced by the latest expressionist researches of Richter. The result is a sumptuous effect of shine and shadow that may be seen as an echo to the Isle of the dead by Böcklin. ​I invite you to watch the video shared by Christie's. Peter Doig closes his eyelids to explore the landscape of his subconscious. He knows that the realistic picture will never properly restore the atmosphere or the feeling. Having lived his youth in Scotland, Trinidad and Canada, he is also an observer of the topographical variety of the world. He is a perfect connoisseur of the most subtle pictorial effects achieved by the great masters. Wishing to express his memory of a snowstorm in Cobourg, Ontario, he refers to Monet. The impressionistic treatment of snow and ice leaves a tiny place for colored spots that gradually take on a prominent role during a prolonged vision. This oil on canvas 200 x 250 cm painted in London in 1994 is titled Coburg three plus one more. It is estimated £ 8M for sale by Christie's in London on March 7, lot 20. Please watch the video shared by the auction house. The snow falls in heavy flakes on the small lake of Cobourg. It veils a scenery divided into three horizontal blocks without perspective as an abstraction by Rothko. This screen which can not be perceived as static distorts the evaluation of the distances, and the four hardly sketched characters who walk through in that chilly day acquire a vibration that focuses all the attention. On a flat canvas of large size, Doig offers by abolishing the perspective the effect of presence so much sought by Rothko in his abstract compositions. His pattern of snow flakes has the same role as the trees that hinder the vision of buildings in other compositions of the same period such as The Architect's home in the ravine or Cabin Essence. In a landscape by Peter Doig, it is no longer possible to distinguish between reality and imagination. Working from photographs, he however likes to be inspired by the countries he visited. In 1994, he reached his full artistic maturity and Jetty, oil on canvas 200 x 250 cm, is one of his most complex artworks. It is easy to recognize the texture of the Canadian Rockies. Indeed, the work was inspired by a picture of a lake in Alberta. However, the tangle of colors leads to a dreamlike atmosphere in the warm tones of a sunset. The man is very small in such a grand environment, but he occupies in silhouette the highlight of the picture, straighton the pier. The trees in the foreground are ghosts so little focused that they look like huge drips. The canoe at mid distance is for Doig a kind of signature. Jetty is estimated £ 4M, for sale by Christie's in London on June 25. The video shared by Christie's displays some close up views of the painting, showing how this figurative artist is the successor of the best abstract colorists of the twentieth century. Very good result for Jetty : £ 7.3M including premium. Inspired by his childhood in Canada, Peter Doig recreates within his head an ideal of life in the wilderness, sheltered in an anonymous cabin. His memory is emotional and not topographical. He searches endlessly in the old images the models of his desire. At the same time he is a very good connoisseur of modern and ancient painting techniques, and a meticulous and talented artist who does not hesitate to use very large formats to share his fantasies. On November 16 in New York, Phillips sells Red House, oil on canvas 200 x 250 cm dated 1995-1996, lot 12 estimated $ 18M. Red House feeds his favorite theme : it expresses the winter with the snow on ground and trees. The house, which may be a lumberjack camp, has a bright color under the twilight sun sifted through a heavy sky. The scattered flakes bring a rhythm to the whole composition. In the foreground, sectioning the image in the middle, the leafless trunk of a birch focuses the boundary between the artist and his own dream. This little place of a chilled paradise is made to be inhabited, just like the winter villages by Brueghel. The men however must not disturb the balance of the dream. They are much more numerous than usually in Doig's scenes and divided into active groups, but they are reduced to their silhouettes according to the usual practice of the artist. The landscapes painted by Peter Doig are very accurate, benefiting from his mastery of detail, perspective, color, atmosphere and reinforcing the realism of the work by skillful variations in the thickness of the paint. Yet his landscapes are not real. Doig transfers on the canvas the scenery of his imagination. He admits that he does not know to paint a landscape from outdoor. He eagerly searches for images that best match the visual memories of his childhood in Canada, far beyond the possibilities of a verbal expression. In the 1990s some themes come regularly such as the reflection of the scene in the calm water of a pond in a dreamlike effect that is indeed duplicated. His parallel universe is not completely wild. There must be a dwelling even if it is close to ruin. A barely sketched human figure sometimes appears. On October 6 in London, Christie's sells an oil on canvas 170 x 170 cm painted in 1996 which offers all these characteristics. It is titled Camp Forestia by reference to the clubhouse on a lakeshore in Seattle of which an old photograph had been accepted within his mental paradise. Camp Forestia is estimated £ 14M, lot 19. Please watch the video shared by Christie's. The image below under copyright of the artist is shared "for fair use" by Wikiart. Peter Doig is now (2014) 55 years old. Connoisseurs appreciate his neat and complex techniques of painting. His images deal with the issues in the relationship between humans and their planet. His urban subjects show the time limited nature of constructions. Now that Doig's art becomes frequent at auction, the parallel between some of his work and the art of Hopper becomes striking despite more than a half-century between them. Both artists question the ephemeral architecture. They work in the studio, Hopper from sketches of abandoned houses made during his car trips between New York and Cape Cod, and Doig with specially collected images. The highway has become an inevitable part in our civilization. A surprisingly surrealist painting made by Hopper in 1939 shows three horse riders rushing at full speed into a tunnel in an uninteresting suburb. It was sold for $ 10.4 million including premium by Sotheby's on May 17, 2012. On a six-lane highway near Toronto, a girl died in a car crash in 1972. In memoriam for her, her 16 year old boyfriend painted in the vicinity a rainbow around an insignificant tunnel passing under a railway. This spontaneous signal for road safety will be acknowledged much later as a work of art. Doig painted this scenery around 1999 in a group of three paintings titled Country Rock. In his strictly horizontal composition, an ugly white security barrier separates the banal road from the unpleasant suburb. In the center, partly hidden behind the barrier, the rainbow borders the black hole of the tunnel. One of these three paintings adds to the mystery an element that Hopper would have liked : the wing mirror, only visible piece of a vehicle passing in front of the tunnel at full speed and in total indifference. This oil on canvas 195 x 270 cm is for sale by Sotheby's in London on June 30, lot 27. The estimate is not published in the online catalog, but the auction house awaits it over £ 9M. This contemporary landscape was sold for £ 8.5M including premium.